she is perfect! love her fishy skirt and rainbow sandals :) ! Aww, she is so adorable! Her skirt is so cute. What is that? Fish? And I love the sandals. I love seeing children dressed well. What a face! The cuteness, squared. This one is just all colours isn't she? 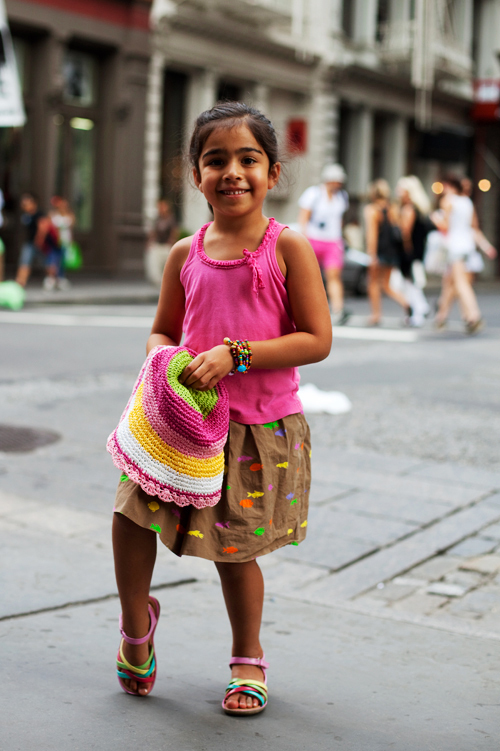 Very cute, from the pink tank to the multicolors flowing from hat to skirt to sandals. Very cute. She wins by default! @ anon (10:19 AM) SO TRUE. I love seeing children dressed as children. She looks adorable! With such a delightfully dressed child, I can't help wondering what her mother wore! I want her skirt! she is relly cute! what cute sandals – my daughter would love these (she likes rainbow clothes). That skirt is wonderful — all the bright colors on a sophisticated, neutral background makes it look like a small version of an adult's garment. My daughter has the same sandals. Cute skirt! Lovely – I too appreciate seeing children who are not styled like mini adults. She looks colourful, comfy and unselfconscious (and her parents obviously have great taste). I love the pointed toe pose! I think the best part of this photo is her pose, how she bends her right leg. Adds much character. Charming – especially her pose! Oh she's just adorable! I love all the colors! This picture just makes me smile; she is so bright and innocent! how cute can you be/dress? the fish skirt is amazing. i want it. So cute! with her genuine smile. And she probably dressed herself! kudos to the kid..
She is so adorable! I wonder if they make those sandals in adult sizes..and with a heel. Pageant mommies take note; there is no improving the beauty of a child. Awwwww! So cute! Is that a beanie? I love the knit beanie! Her skirt is adorable! Her shoes and shirt to match. I honestly want to know where she got her bracelets! great smile and colors. however, clothes seem new. prefer broken in threads on children. it assumes physical play in dirt/concrete, and an unapologetic freedom. Super cute! You gotta love it. way too cute! i would love to wear that skirt she has on! I love her little shoes! Is it just me, or is this child mocking me? Just kidding. Adorable and fun moment, and again, the joie de vie is infectious. Kid-power, fun-power! Stay happy in the moment. super cute.. looks like she is wearing crewcuts. OMG, isn't she the cutest?! Might as well start them young. Love how coordinated her outfit is and those little fishies are super cute! This photo makes me smile. That's right! Only kids are able to pose with cute foot gestures and look natural. Supermodels and fashionistas doing the same look ridiculous. Nice shot. look at that toe point pose!! she is just adorable! love the colors on her! btw congratulations for the donna karan new campaign, really great! I wish the skirt was my size. A picture of a beautiful child who has the innocent look that a girl her age should have in this very tough world. aww, she's got that toe pop down! and i kind of want her skirt for myself. My daughter also has the same sandals. A steal at Target and goes with all her clothes. This child just irradiates well-being. What a beautiful smile! she looks well loved, cared for and happy. beautiful! Oh, she's so sweet! Love the colors. Keep bringing us kid pictures…LOVE them! That's what being a child is all about. Candy colours AND smart accessories? That girly girl (and Mama) has taste! cutie patootie! i agree, post more toddler/child photos. nice to break things up a bit. and plus, everyone loves a cute kid. except, you know, those people who don't. What I want to know is: Did she choose the outfit or was it chosen for her? She is a child and very cute but you do know there is a difference in the definition of childish vs child-like. What a great look! But I'm skeptical of your tag, "Childish Color." She looks put together and comfy amid the brights and rumply neutral of the skirt. To me, that's truly sophisticated–nothing childish about it! I think the tag doesn't match the way the photo conveys her. How about "Kid Color" or "Childhood Charm"? Or something better…ideas? Do the parents know their kid is on the net? Wonderful images. I liked it. It's really cool how the backround seems to be in incessant motion and the little girl is the only stable still object. Candy colors. She must LOVE those sandals. Someone has great taste, literally and figuratively! She's fantastic, and so are those sandals! I'm secretly a little jealous they dont come in my size. The braclet is just great too. My daughter has those sandals – I love them with so many of her summer outfits. Nice to see a child here. And yes, they're from Target. with the barrage of fashion blogs flooding the internet, one sometimes gets a bit fatigued with fashion snaps that start to look too much like the next photo. Your blog is different, and it's photos like this one, and your willingness to use kids as subjects that keeps things fresh. She looks like a comfortably happy little girl, very cute! my daughter has them and at 12.99 they are a steal. what a cutie! love the splash of colors! cant leave out the young ones! Just let me mop up the floor as my heart is melting!! She is so adorable!! Beautiful vibrant colours on a beautiful little girl! Gorgeous skin tone! Gorgeous skirt! like a piece of art! doesn't she look like she's on pointes, like a ballerine? colorful in a nice tone. I realy like your purse with your sandals together. from Daphne age 8. Lol..Cute its dora in real life. LOVE IT. 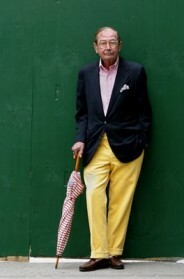 It would be great seeing more kids actually dressing their age!